Check out Cebu Pacific's Labor Day Seat SALE happening NOW until May 2, 2018 (or until seats last)! 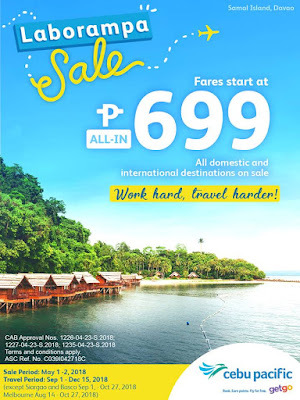 Enjoy airfare as low as P699 base fare to domestic destinations, and as low as P1599 to international destinations. Travel Period: September 1 to December 15, 2018, except Surigao and Basco (September 1 to October 27, 2018), and Melbourne (August 14 to October 27, 2018).